Ghale Gaun Trekking, Gurung culture exploration trekking, | Unique Nepal Adventure Treks & Expedition Pvt. Ltd.
Day 01: Arrival at Tribhuvan International Airport in Kathmandu and a representative of Unique Nepal Adventure Trek will welcome and transfer you to your selected hotel by private vehicle. Day 02: Sightseeing in Kathmandu valley by private vehicle with an expert tour guide. Day 03: Kathmandu to Besisahar (760m) drive (6-7 hrs) or Khudi (790m) drive (45 mins) walking (2hrs) stay overnight at lodge or in camp. 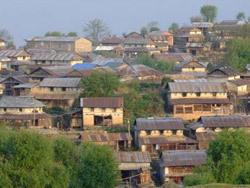 Day 04: Trek to Ghalegaun (1800m) walking (6 hrs) stay overnight at lodge or in camp. Day 05: Trek to Baglung Pani (1595m) walking 5-6 hrs) stay overnight at lodge or in camp. Day 06: Trek to Laxmi Bazaar (1300m) walking (6-7 hrs) stay overnight at lodge or in camp. Day 07: Trek to Begnas Tal (Lake) walking (5 hrs) and drive back to Pokhara and stay at a hotel in Pokhara. Day 08: Pokhara to Kathmandu by bus (6-7 hrs) (202kms) by flight (45 mins) stay at your selected hotel in Kathmandu. One night in Pokhara hotel with breakfast. Accommodation in a simple lodge or camping in twin shared tents with mattress. Return transportation from Kathmandu to Besisahar and from Pokhara to Kathmandu by bus or by flight. All necessary equipment for camping if we arrange camping trek, such as tents and kitchen equipment. If camping is organised then dependent on group size, cook, kitchen boy and extra porters. All expenses for guide and porters – meals, accommodation, salary, equipment, insurance, transportation (bus/flights) etc First Aid kit bag. Lunch and dinner in Kathmandu and in Pokhara.